BodyboardinGreece is a web site dedicated to the bodyboarding experience. A place where spongers can share pictures, ideas and info about BBing in Greece. Keep in touch with your local scene! 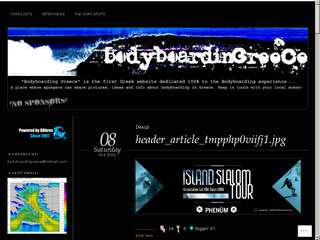 Visit the website of Bodyboarding Greece now ! Bodyboarding Greece , belonging to category "Greece"